Buckwheat – that strong tasting pseudograin that most people either love or hate! It’s one of those things in the food world that can be pretty polarizing, like brussels sprouts. Personally, I love buckwheat when it’s blended with other things! It has a great earthy taste that’s perfect mixed with the sweetness of pure maple syrup. 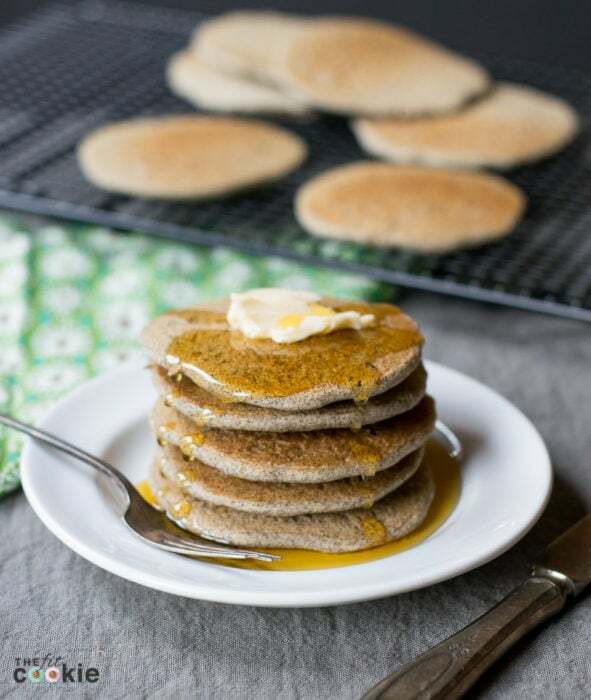 I don’t know that I like to buckwheat straight since it’s so strong, but I like it when it’s mixed with other grains, like in these Gluten Free Buckwheat Pancakes. Pancakes also happen to be one of my favorite hot breakfast foods to make since they are so easy and are almost always foolproof. I admit I can be a lazy cook sometimes – I like easy recipes! If I’m hangry hungry, muffins and quick breads just take too long to cook. And since I can’t have eggs, pancakes are usually my go-to for hot weekend breakfasts, along with a side of bacon. 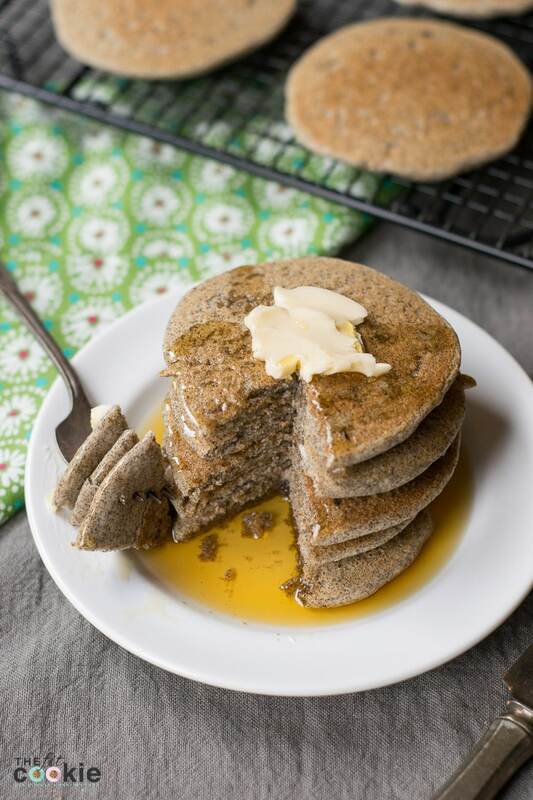 If you’re one of those people who happens to like buckwheat, than you’ll enjoy these Whole Grain Gluten Free Buckwheat Pancakes. They are milder since they are only half buckwheat flour and half whole grain sorghum flour, so they don’t have that overwhelming buckwheat flavor that some people really don’t like. These pancakes are based off of my best gluten free pancake recipe that I have made for years, just making adjustments to the types of flour we use. The older recipe uses rice flour, but I use sorghum flour these days. If you don’t have sorghum flour, you can easily sue brown rice flour instead. Add some mini chocolate chips like the old recipe if you want a fun twist! Want an even milder buckwheat flavor in your pancakes? Simply adjust the ratio of flours by using 1/4 cup buckwheat flour and 3/4 cup sorghum flour instead of 1/2 cup of each. 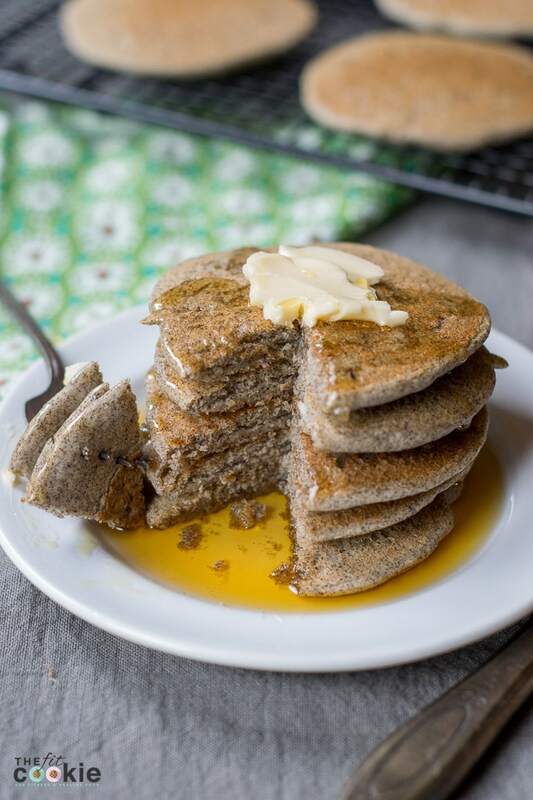 If you can’t get enough buckwheat, you can swap that ratio and use 3/4 cup buckwheat flour and 1/4 cup sorghum flour (or even 2/3 to 1/3 cup ratio). 2 Tablespoons ground flaxseed this is an egg replacer, don’t skip this ingredient! Preheat a griddle until it’s hot (on an electric griddle, I heat it to 400 degrees). In a medium bowl, whisk together the sorghum flour, buckwheat flour, ground flaxseed, baking powder, salt, and cinnamon. Whisk into the flour blend the coconut milk, olive oil, and maple syrup until a moderately thick batter is formed. Thanks Sarah! I really appreciate this recipe. 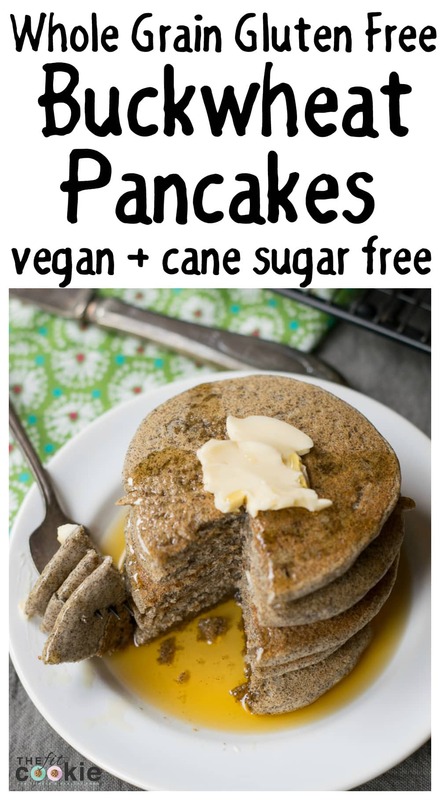 I haven’t used buckwheat flour on it’s own before but I am going to have a try at these.﻿ Thanks for sharing. These pancakes are amazing with a thin layer of crispness outside! The insides are yummy and tender. I used slightly more buckwheat flour than sorghum flour and unsweetened vanilla soymilk. I replaced the olive oil with melted coconut oil. I ate them plain, no toppings; they are that good. Thank you, Sarah! I discovered that you can prepare a double batch of dry ingredients and save half for another day. Measure out 1 1/4 cups of the dry mixture for each batch, adding the milk, oil and maple syrup only when you are ready to cook. So glad these turned out great for you Eileen! I loved these ones, I wasn’t sure what my kids would think of buckwheat, but they loved it too!